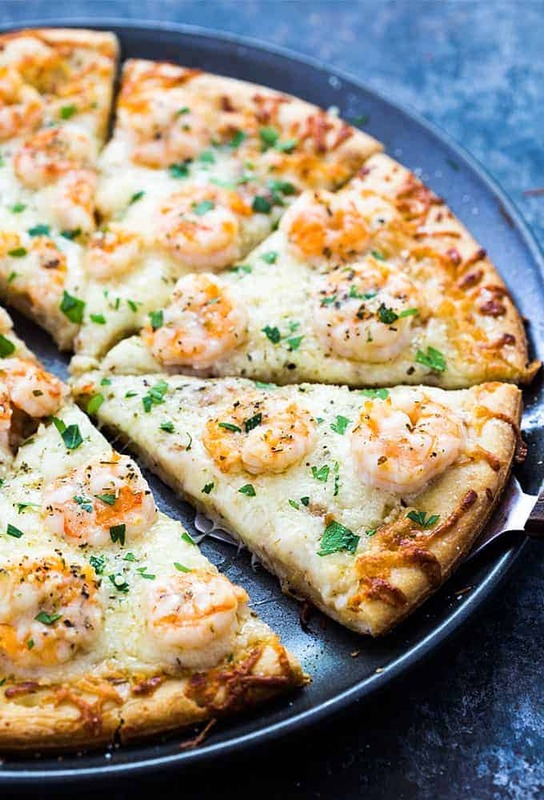 Seriously… if there’s 2 things that I love on this earth it’s cheesy pizza and shrimp. It’s the best of both worlds here, people! 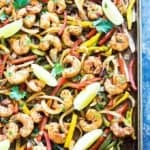 And if your shrimp are already peeled and deveined, this recipe comes together in just 25 minutes. 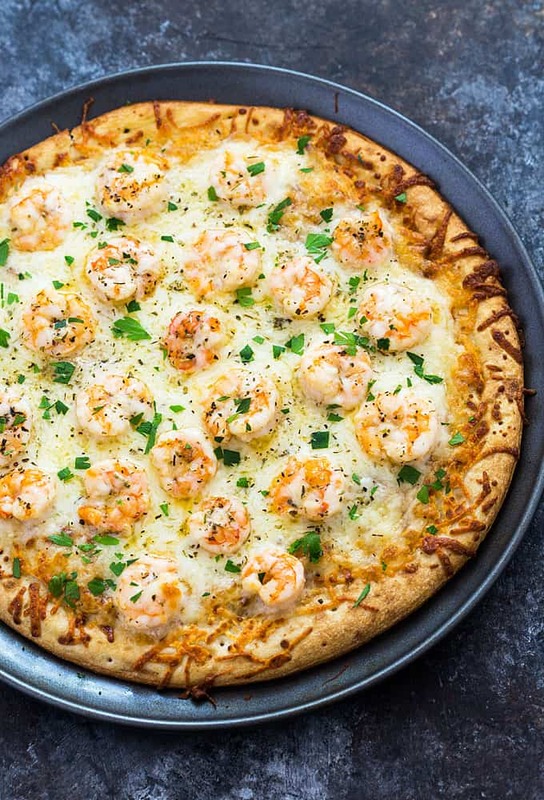 I used a pre-made crust instead of dough just to make sure my shrimp wouldn’t be overcooked and dry. 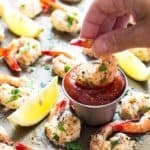 The scampi sauce helps to keep the shrimp moist and the secret is sautéeing the shrimp just until pink before placing them on the pizza. Everyone will think you made a gourmet pizza in less than 30 minutes. Enjoy! 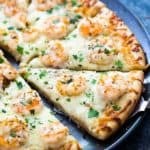 Shrimp Scampi Pizza – Everything you love about shrimp scampi in a cheesy pizza in under 30 minutes! Melt butter and olive oil in a skillet over medium high heat. Add garlic and cook until fragrant, stirring constantly, about 1 minute. Add wine, oregano and lemon juice, stir to combine and simmer for 1 minute. 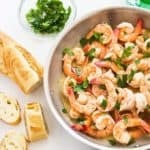 Add shrimp and cook just until turned pink. 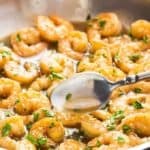 Remove shrimp with a slotted spoon and place on a plate. Set aside. Remove pan with juices from burner and set aside. Bake CRUST ONLY for 4 minutes and remove from oven. Brush crust with sauce from pan (about 1/4 cup). 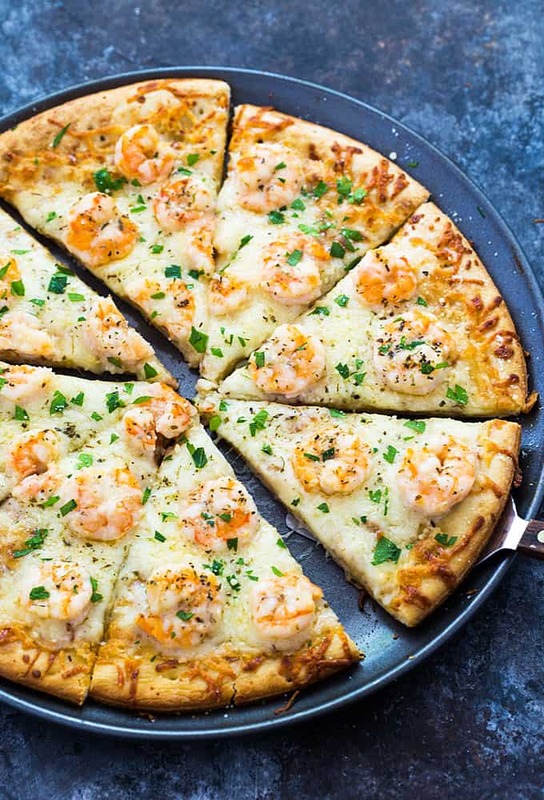 Top with 1-1/2 cups of the cheese and evenly distribute shrimp on top of cheese. Sprinkle the remaining 1/2 cup of cheese on top of pizza. Return to oven and bake for 6-8 minutes, or until cheese is melted and bubbly. Top with Parmesan cheese and fresh parsley, if desired. 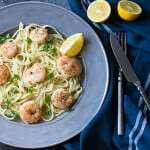 I think that shrimp scampi is one of the world’s greatest foods, and here you’ve combined it with another of the world’s most perfect foods. You are a genius, I am sure of it. This was great! Added a diced Roma tomato and some spinach. Yum! 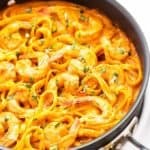 Made this for dinner and will be making it again and again! DELICIOUS!!! Made this using a “ready-made” bag of pizza dough, everything else was exactly as the recipe called for (except I forgot the Parmesan at the very end). It was pretty easy to pull together, and the result was excellent! The only thing I will do differently next time is to let it cook for 2-4 more minutes at 450F – while the crust was not raw, it could have been crispier without scorching or burning. My oven tends to run a bit hot, so I was surprised to find this slightly under-done rather than over! But, obviously, that’s not a recipe issue – this was a nice pizza! thanks for your reply. this is my favorite cheese company. I have not tried this particular cheese though I will soon and I’ll let you know hot it comes out. Thanks for the recipe. Delicious topping. Dough needed longer in the oven though (in my opinion)..